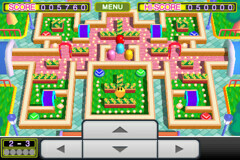 Pac-Man fans will greatly enjoy the newly released Pac-Man Remix game for the iPhone and iPod touch! The object of the game hasn’t changed much. Pac-Man still eats dots, power pellets, and ghosts when they turn blue. He still also gets chased by the ghosts when they’re not blue and loses a life if they catch him. The addition of the 3D graphics and fun animations adds a whole new dimension to the game. As an added twist, the Remix version has exclusive features like boss battles, stage-specific gadgets, and power-up items! Pac-Man is stranded on an island full of ghostly enemies — big and small. The island is divided into 6 different sections. Within each section are 5 different levels, which means there are 30 different levels altogether. The last level of each island section is the big boss battle. Before playing each level, a short colorful clip shows you the challenges you will face in the next stage. Although, with only 30 levels, gameplay seems a bit short. Each game starts off with the usual 3 lives (but you can change this in the options). If the game is over and you would like to still advance to the next stages, click on “Continue” to restart the last stage with 3 lives, but your points will be reset back to 0. Pac-Man Remix offers two types of controls — Arrow Keys and Flick. To make changes, go to “Options” and scoll to the second screen, and click on “Change Control Type.” You can also change this option during a game by clicking on “Menu.” I personally think the “Flick” control is much easier to use. The Arrow keys seem to be too close to the center so clicking on feels a ltitle bit awkward. There’s also two modes of playing – normal play (continue game) or free play. Click on “Start Game’ to play a continuous game (from level 1 to level 30). Choose “Free Play” skip around to play the levels you enjoy the most. New power-ups give Pac-Man the power of being invincible, dash quickly across the maze, jump over items, create a mirror illusion of himself, and more. Warp Panels on various stages allows Pac-Man and ghosts to transport themselves from one section of the maze to another. You’ll find a few tricks here and there that will keep the game interesting. To see more, see the “Items, Tricks & Traps” button of the “Help” section. There are a few game enhancements I’d like to see in the next version. First, I’d like to see a better background story for the game. Wouldn’t it be nice to know why Pac-Man is stranded on an island full of enemies? Second, I’d like to be able to have more than one saved game. Lastly, even though the game is challenging and fun, 30 levels doesn’t seem to be enough gameplay. Unlike the other Namco Remix games, Pac-Man Remix does not have a classic game option. This is probably because Pac-Man and Ms. Pac-Man are already in the iTunes store as standalone apps. Pac-Man Remix is currently on sale in the iTunes store for $4.99. This is a deal considering Pac-Man Classic and Ms. Pac-Man are $5.99. This article was originally published in iProng Magazine Issue 46, featuring Colbie Caillat, LMFAO, Kate Earl, Pac-Man, Lynam, iPhone stereo systems, and Duke Nukem.